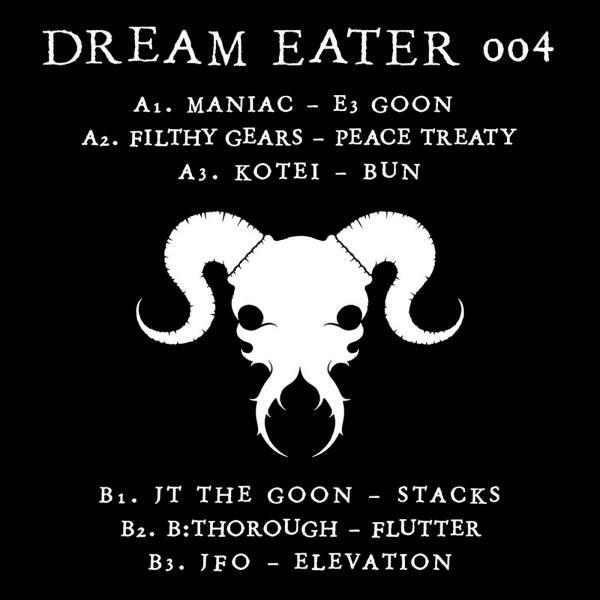 Dream Eater Records present another collection of the finest music at 140BPM from both rising stars and firm favourites. A1 Maniac - E3 Goon: Having produced hits for Wiley, Tinchy Stryder and Chipmuk Maniac is a true legend of grime. E3 Goon is a personal all-time favourite of mine. A2: Filthy Gears delivers once again with the serious hitter that is 'Peace Treaty' A3: We present Kotei's vinyl debut, he is another up and coming producer with a both grime and dubstep influenced sound. B1: JT The Goon, another grime powerhouse, never fails to deliver and 'Stacks' is no exception to this rule. Classic grime feel with his signature flutes. B2: B:Thorough's vinyl debut is a statement of intent! 'Flutter' is Perfect blend of new and old school grime sound - the melodies are killer! B3: Over the past few years JFO has been consistently producing brilliant dungeon sound dubstep. 'Elevation' is masterfully crafted, sparse and definitely weighty.